In the movie above, a cavitating bubble is illuminated with a floodlight that is shining directly into the camera. 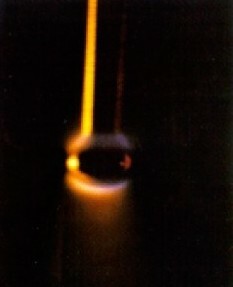 Nevertheless, the flash of sonoluminescence is easily seen as the bubble reaches its minimum radius. When this container of water is dropped just one inch, the impact causes a bubble of gas to emit a flash of light that is a microsecond long with an intensity of 150 Watts. The interior of the bubble becomes over twice as hot as the surface of the sun. 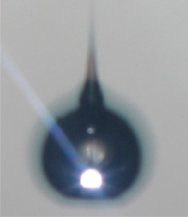 A single flash of light from a 50 μm radius bubble in phosphoric acid. The tube shakes at 40 Hz. This set-up was optimized by Avik Chakravarty whose memory we wish to honor. Integrated into this photograph are 1,500 flashes of light from an imploding bubble in sulfuric acid. 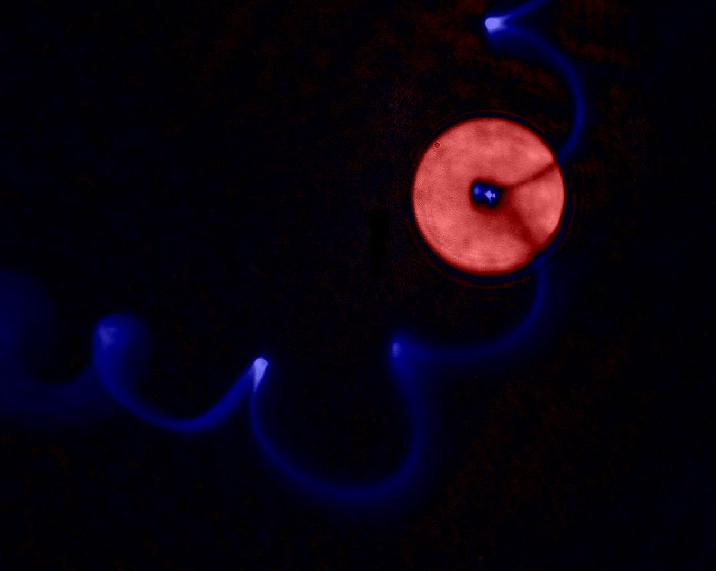 The blue dots/line is the sonoluminescence while the red disk is from a laser backlight which creates a shadow, outlining the bubble at its 90 μm maximum radius. We became interested in Sulfuric Acid as a result of the work of the Suslick lab. A standing sound wave with a frequency of 40,000 cycles per second generates 40,000 flashes of light per second that can be seen with the unaided eye. 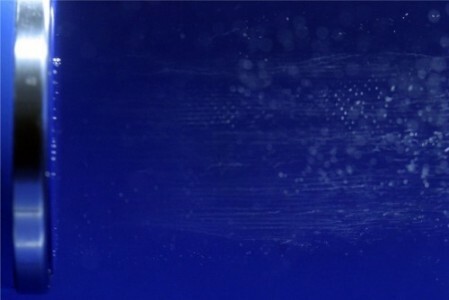 The blue/purple dots are the micron-sized spots formed in water by imploding bubbles. Photograph by Ed Kashi. Felipe Gaitan was a big help to us. 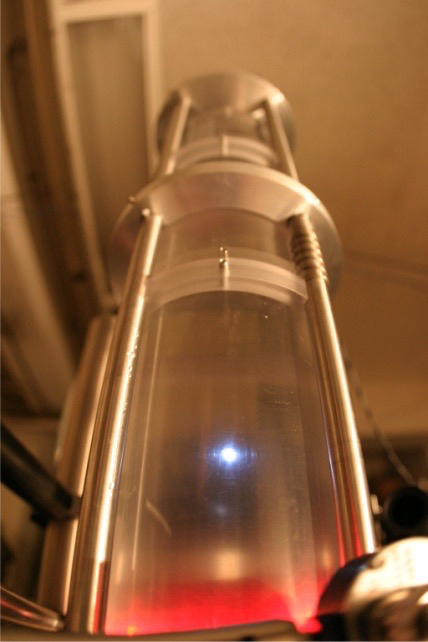 Acoustic neutron detector: If a fluid is sufficiently clean and degassed, it can hold a sound field in excess of 30 atmospheres without cavitating. Moe Greenspan pioneered such systems and mentioned that they could be used as neutron detectors. In the movie you can see and hear a burst of cavitation when a neutron crashed into a molecule to make a tiny vaporous cavity, which is then exploded by the high amplitude sound field. The weak neutron source is in the black tape. Nuclear Fusion: Can one achieve the inverse process, namely, can the energy of a strong sound wave (~30 atm) implode a bubble with such force that it can be used to make fusion and therefore neutrons? Rusi Taleyarkhan claimed to observe nuclear fusion in such an arrangement. But this was not independently reproduced. Faraday said: “nothing is too wonderful to be true” that it can’t be experimentally reproduced! I quote Faraday in an interview with the BBC for their show on Horizon: “An Experiment to Save the World”. Neutron dection: This is the neutron detector designed and built by Bob Cousins and Brian Naranjo to search for new routes to nuclear fusion. This detector carries out time-correlated neutron counting with an efficiency of 20% and nanosecond timing. All these examples of sonoluminescence have led us to propose that sonoluminescence is achieved in a dense plasma. 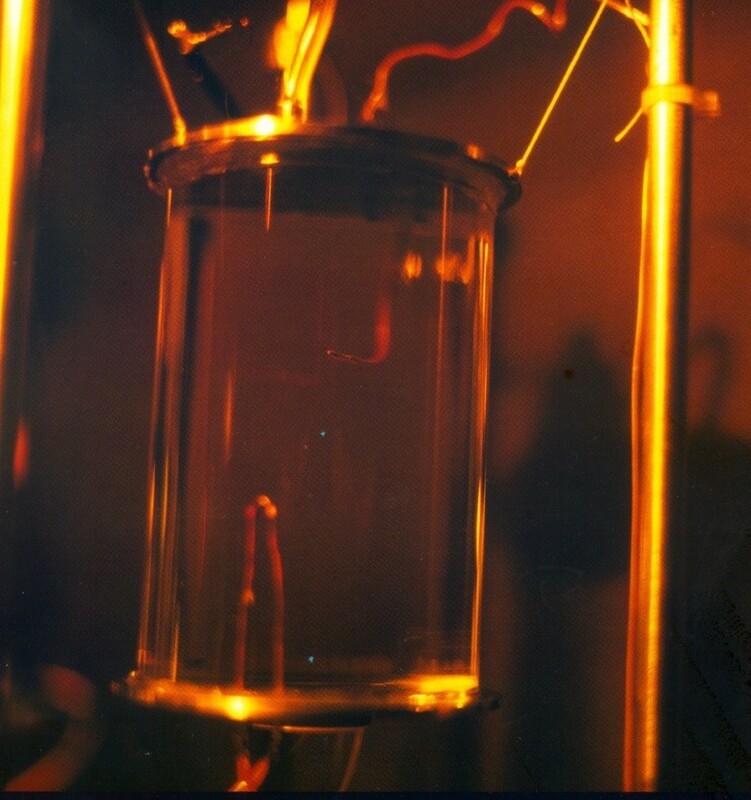 In fact, these plasmas are so dense that the bubble blocks visible light. In order to stop light, a huge charge density is needed. Here, the free charge density is greater than 1021 free charges per cubic cm. To reach such a charge density requires cooperation among the electrons and ions in such a way that a new phase transition occurs. 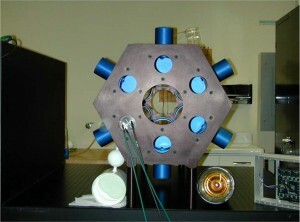 See “Search and Discovery” news story in Physics Today April 2012. Read more about dense microplasmas. Nature Wants Sonoluminescence and Cavitation to Happen! 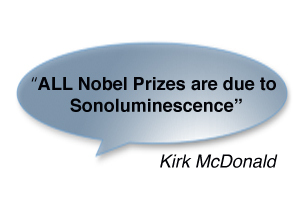 The parameter space is so broad that sonoluminescence has even found medical applications. Sonoluminescence from a few mm tip vibrating at 30 kHz. The wavelength of sound is larger than the spherical tip. This device is used for ultrasound assisted lipectomy. Photograph by K. Weninger and C. Camara. In a traveling wave, collapsing bubbles shoot out a spike whose width is much smaller than the bubbles. Photograph by B. Kappus and S. Khalid. 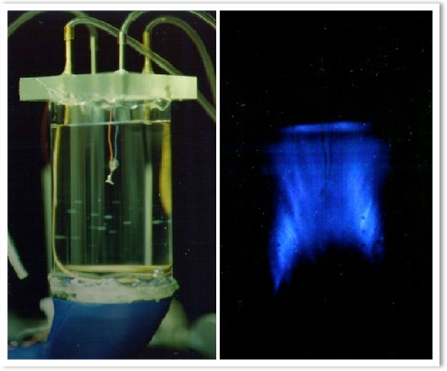 Sonoluminescence is an example of cavitation, which is the more general phenomenon describing the bubble formation and motion in a sound field. In this image, cavitation and micro-streaming is generated in a traveling 1 MHz sound wave in water. Cavitation and micro-streaming might play a role in ultrasound medical therapeutics (www.sonescence.com). Photograph by J. Koulakis. 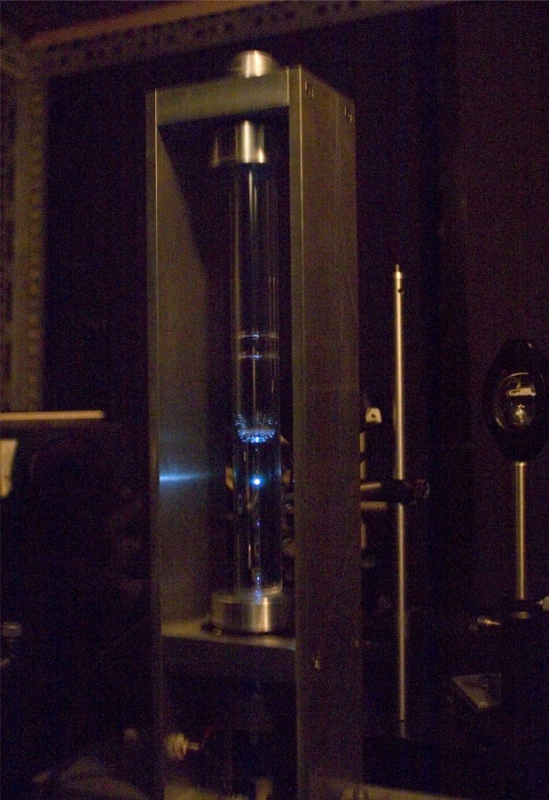 Sonoluminescence from xenon bubbles in water driven by a sound field with a frequency of 1 MHz. A flash of light is emitted as the implosion reaches 100 nm in size. The spectrum has all colors ranging from far UV to infrared. The sun is a 5,800 K blackbody and this bubbles is more ultraviolet than a 10,000 K blackbody. Here, the wavelength of sound is smaller than the transducer. Credit to K. Weninger and C. Camara. 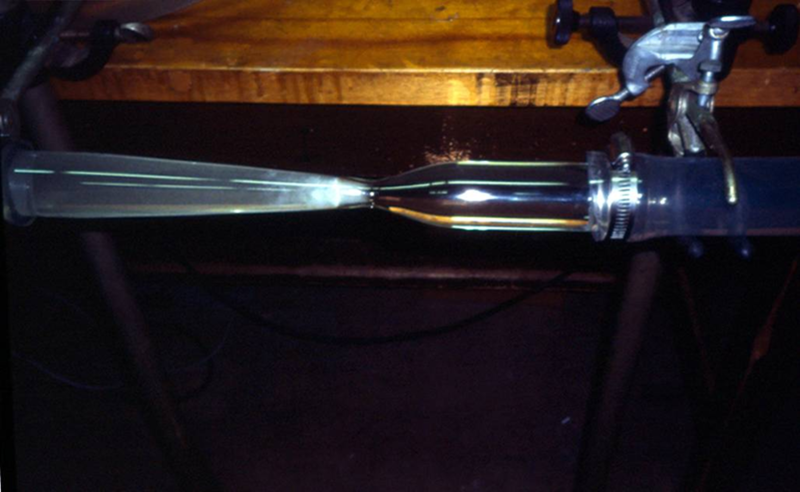 Water flowing right to left through a constriction creates cavitation and light. Photograph by K. Weninger and C. Camara. Sonoluminescence: sound into Light, Scientific American February 1995.